Apologies again - I've hit one of those occasional basing back-logs. 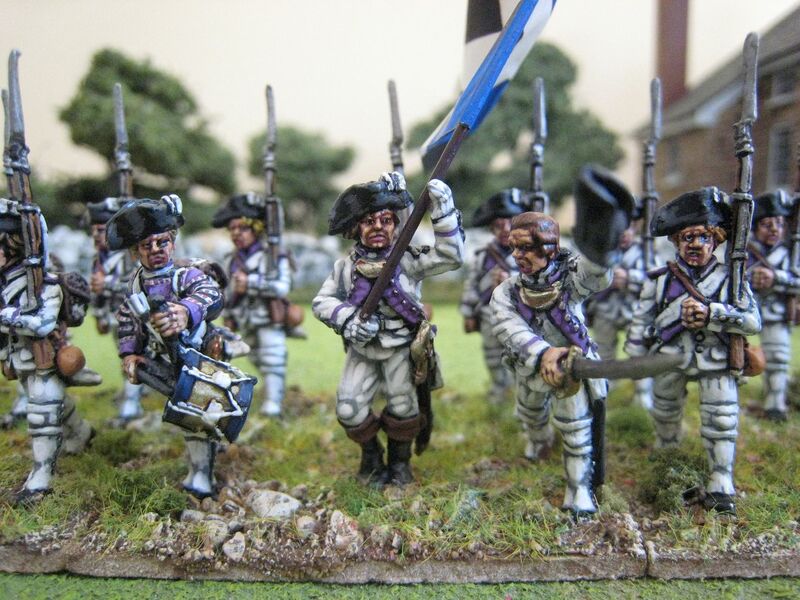 I currently have 54 finished figures going through the basing process, including the completed first musketeer battalion of the Prussian 10th Infantry Regiment, more AWI French chasseurs and the Dutch 2nd Line Infantry for 1815. All these are rather large units and that has created a squeeze on basing and finishing the units off. 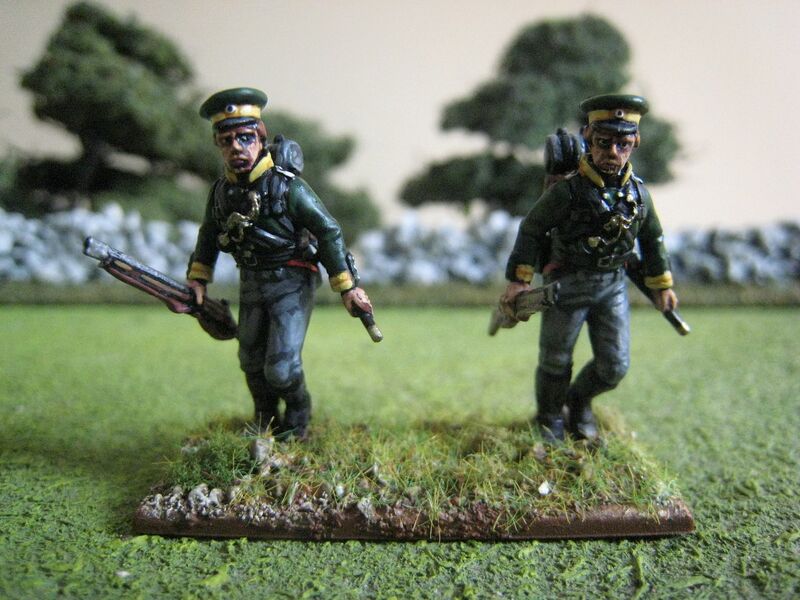 I had intended to blog about the 6 volunteer jaeger figures that come in the Perry Prussian infantry box, but the pictures I took the other day are pretty rubbish (see left) so I need to take some more. 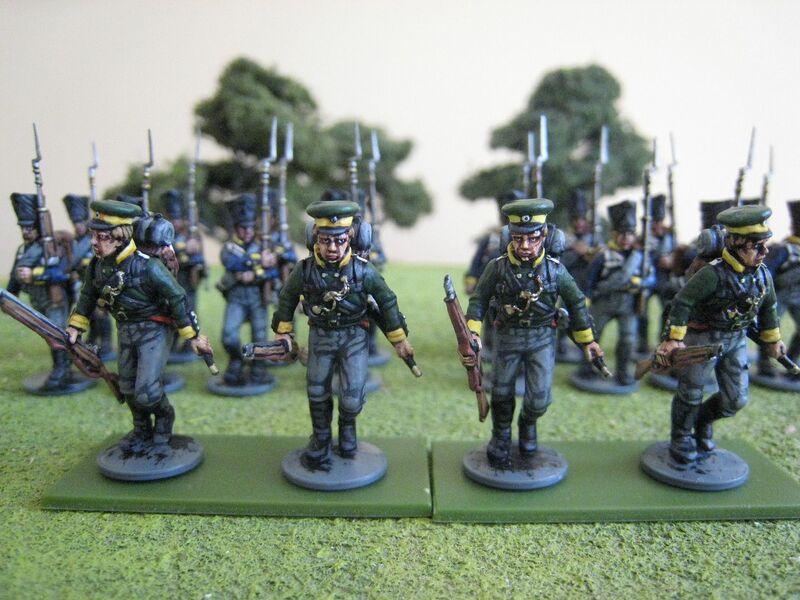 I decided in the end to paint all the Prussian figures and so the battalion is 40-figures strong. As that means 10 figures for each company I have had to buy larger bases, which haven't arrived yet. The Dutch infantry battalion is something I have been meaning to do for ages. I painted 6 figures a few years ago and then moved on without painting any more. Whilst sorting stuff out in advance of my impending house move I found the rest of the unit and thought it was high time I finished it off. As it happens, I have now decided not to use the original 6 figures and so I am building the 24-figure unit from scratch; I'll explain why in due course. Hopefully the Dutch will be finished in a week or so and then the French chasseurs will be finished. 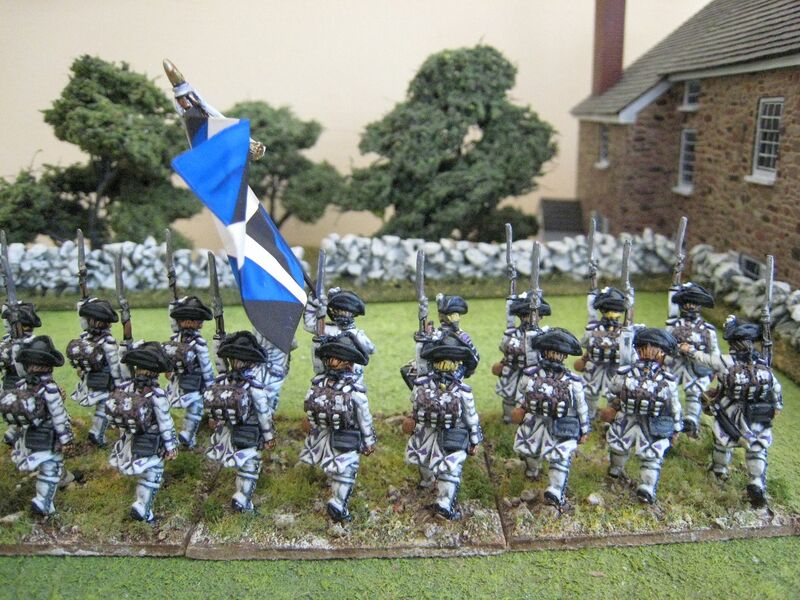 After that I suspect there will be more Eureka AWI dragoons, as it's high time I returned to those. 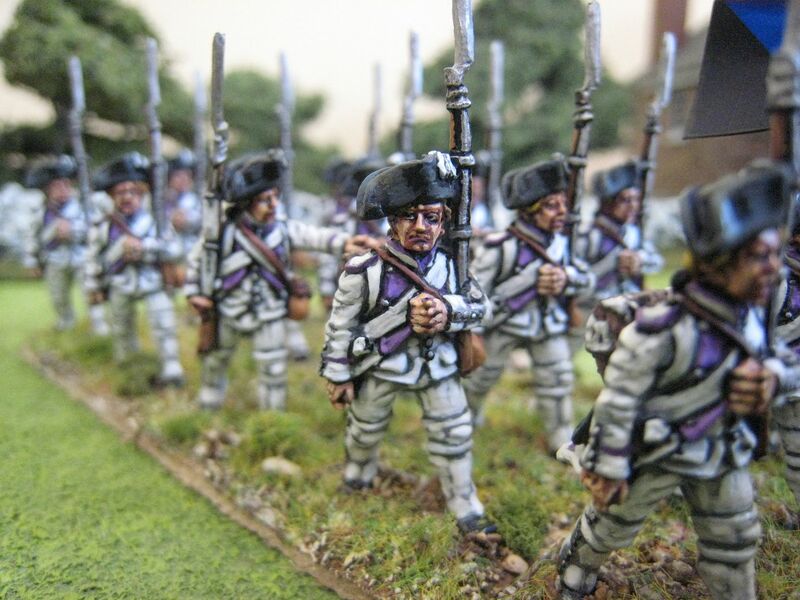 Now I've finished the Perry Prussians box I don't intend to paint any more Prussians any time soon. I think my 1815 cravings will be met by concentration on Bachelu's division, the Middle Guard, the Dutch-Belgians and (as yet a mere twinkle) the KGL. Here are the further Eureka Miniatures figures that I mentioned a short while back. These are from the Revolutionary French range. I am not sure what codes they are exactly, as I picked them out at Eureka HQ in Melbourne (with help from John Baxter and Mark Spackman - hi guys! ), but they are all actually "grenadiers" rather than "chasseurs". 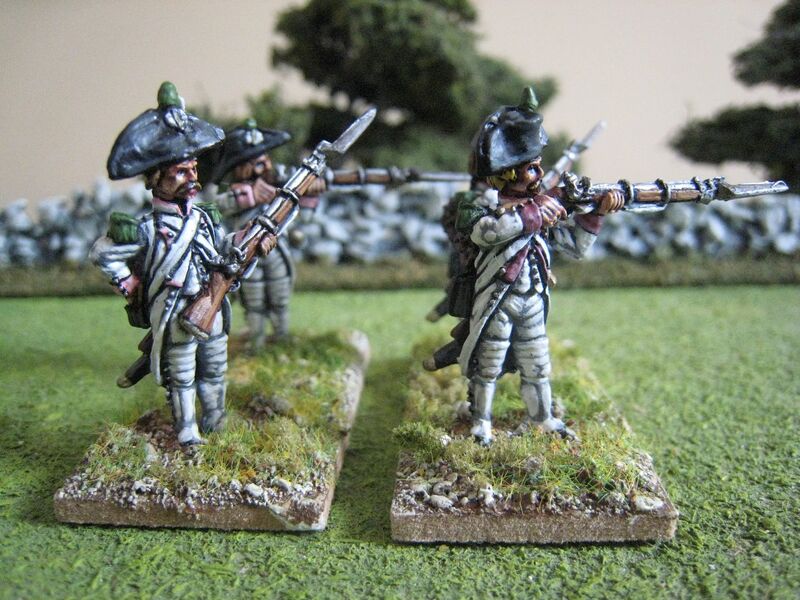 I have no idea how the 1790's uniforms of the two flank companies differed, but the uniform on these figures is certainly very close to that of the Perry Miniatures chasseurs. Leaving aside the headgear for a moment, these Eureka figures have the standard flank company accoutrements of moustaches, epaulettes and swords. 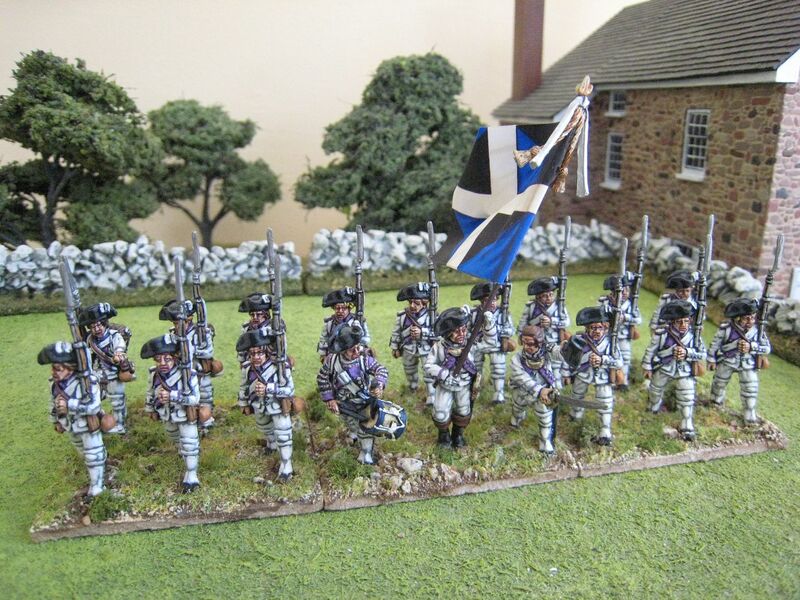 The coat tails are long, but that is in keeping with the 1779 regulations and the Chartrand Osprey refers to some units having tails that were even longer than the regulations required. So it's only really the hats that are a problem, in that they are clearly proper bicornes and much larger than their Perry equivalents. I decided not to remove the pompoms, because some of the illustrations in the Chartrand and Mollo books show these on flank company soldiers. I did, however, file off the grenade emblems on the catridge boxes. I like these Eureka figures. 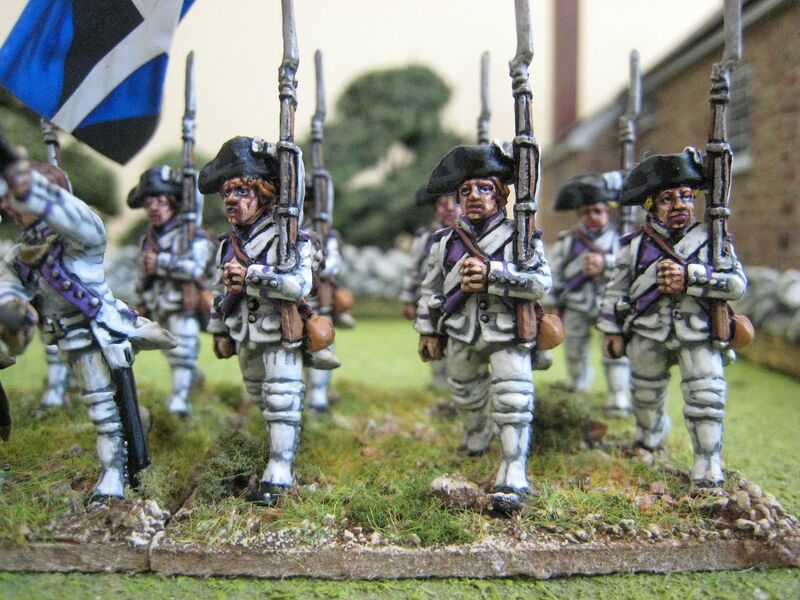 They have style and when painted up in white I think they do pass muster as AWI figures. 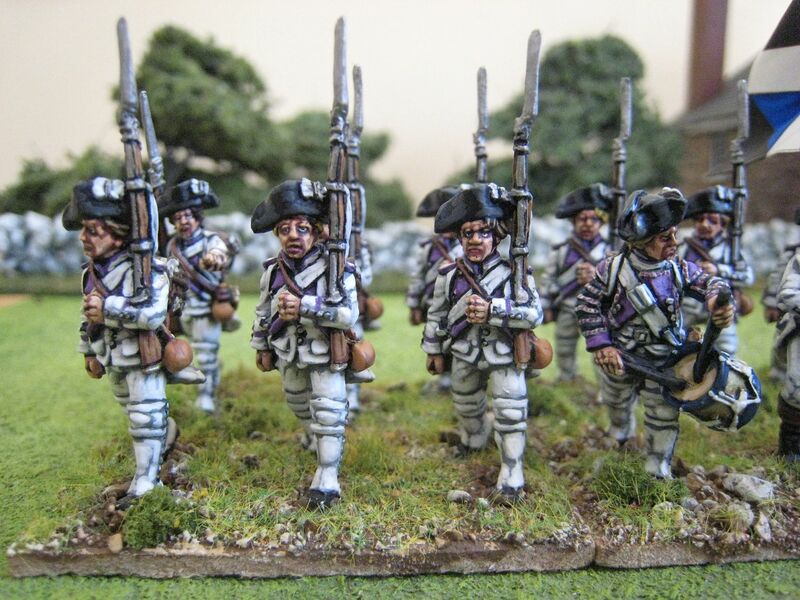 As I said before, I think it is unlikely that the Perry French range will include skirmishers (but you never know). The Eureka figures are larger than the Perry ones, about 30mm from toe to top of head; the hats then add anything up to another 4mm in height. The two regiments represented here are the Soissonnais (in the crimson facings) and Touraine (in pink). 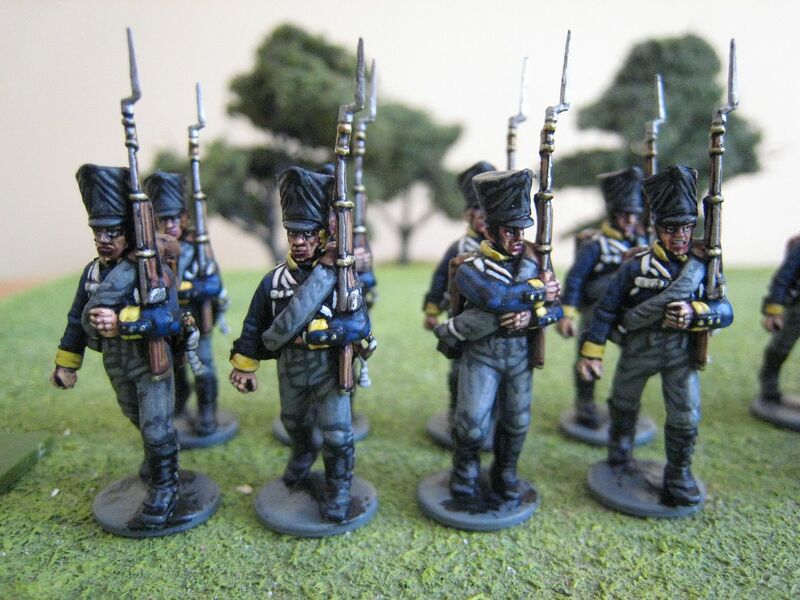 I chose these regiments simply because I liked the facing colours! The way I paint the white coats is as follows. I undercoat with Army Painter "Uniform Grey" spray, an almost exact match with Coat d'arms "Uniform Grey 525" which I use for touching up. This undercoat acts as the base coat. The highlights are then Foundry "Arctic Grey 33A", Coat d'arms "Light Grey 211", Coat d'arms "Tank Light Grey 526" and then finally pure white (any brand will do). I would also like to mention that Christopher "Axebreaker" has posted a review of the new edition of the "British Grenadier!" rules that I use on his superb blog. He kindly mentions the large number of photos of my AWI collection that illustrate the book (which is why I haven't blogged on it myself!) and then comments on the book and the mechanics of the rules. The new edition is pricey, and follows the current trend of new rules being glossy, highly-polished hardback books. Personally I didn't hesitate in buying this new edition because "British Grenadier!" are the only AWI rules I will ever use. Those who find the game slow or frustrating for an attacking player will find new rules in this edition that speed up movement and make charges a tad more likely to succeed - so anyone who has dropped the rules on either count may like to give them another try. 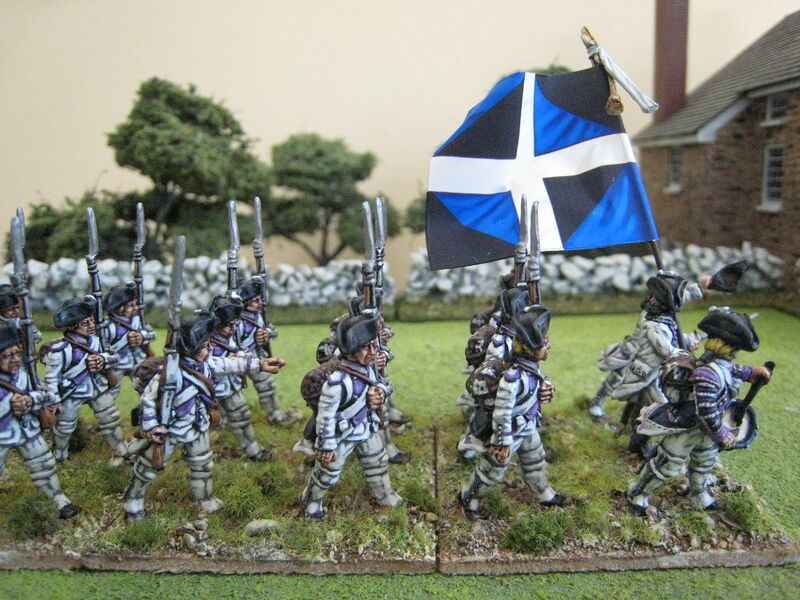 And with Perry Miniatures releasing plastic AWI infantry at some stage (perhaps in time for Salute next year?) and a remake of "The Patriot" in the works it's a great time to get into the period! 8 figures. Painted June 2011. 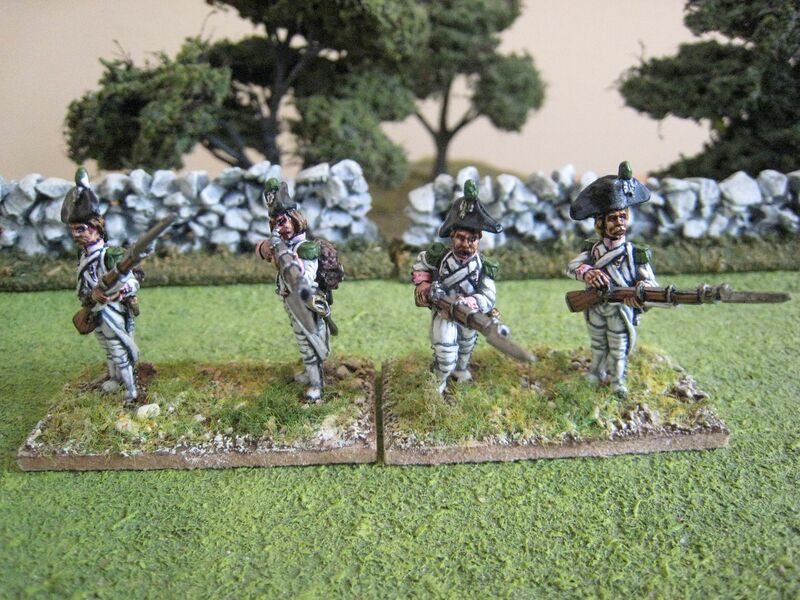 I have some AWI French skirmishers to post about in a couple of days, but in the meantime I thought I'd post a couple of photos of the other large unit I am currently working on (i.e. 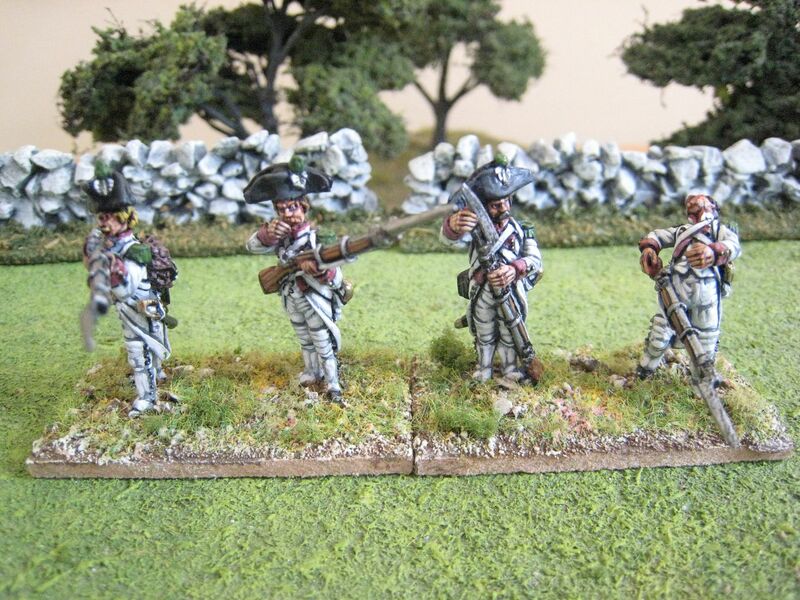 in addition to the 24-figure AWI French chasseur unit, which is now three quarters finished). 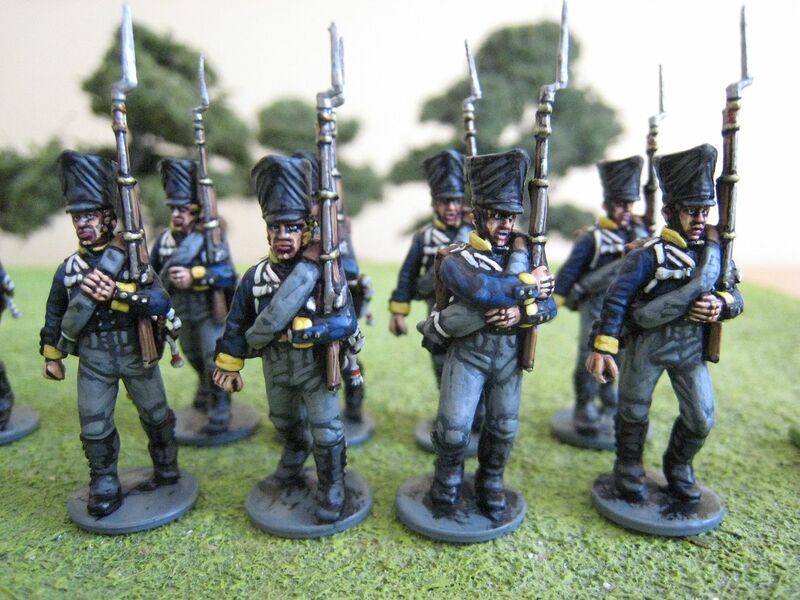 I bought a box of Perry plastic Napoleonic Prussian infantry at Salute and, having painted a couple of test figures back in April, decided last month to push on with the rest of the box. I will provide a proper review when I have the regiment finished, but my overall reaction is very favourably - the figures are dead easy to paint (like the plastic French infantry) and easy to put together. My only concern is how the backpack fits onto the figures, which doesn't quite seem to work as neatly as on the plastic French infantry. 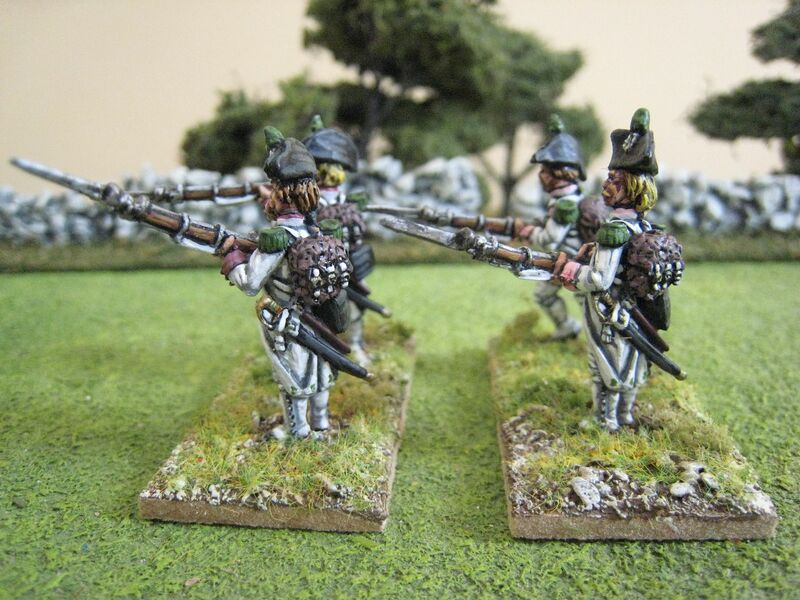 The unit I am building is the 1st musketeer battalion of the 10th Regiment ("1st Silesian"), in Hacke's 13th Brigade. I chose this regiment simply because I liked the yellow facings and the 1st battalion's flag comes with the box. I think the regiment was involved in the fight at Plancenoit, but my research is ingoing. However, one issue I need to consider now is the number of figures. 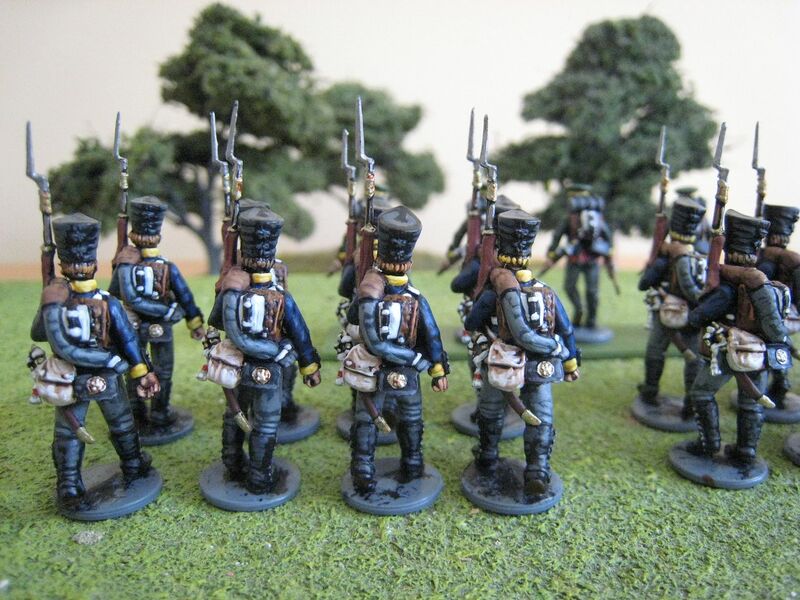 The Waterloo orbat on the "General de Brigade" website has Prussian infantry battalions at 32 figures mostly, with a few at 24 figures. I know that at full strength a battalion would be close to 800 men, or 40 figures at 1:20 (which is what you get in the Perry box, plus 6 jaeger). I'm assuming that the GdB orbat takes account of casualties incurred in the various battles preceding 18th June itself. However, I don't think Hack's 13th Brigade was present at Ligny and therefore I wonder whether the units in this force should not be closer to 40 figures rather than 32. I note comments on the GdB forum that whilst the 32-figure Prussian battalion is pretty standard in wargaming it may also be something of a "received wisdom", and that units at the beginning of a campaign or which have not yet seen action (like the 10th) would probably be close to full strength. Like any sensible wargamer, I prefer smaller units (and so less painting) whenever possible and when tackling something like Waterloo a certain amount of "shrinkage" is required for space reasons anyway; but any thoughts from readers more versed than I in the Prussian army of 1815 would be welcome! 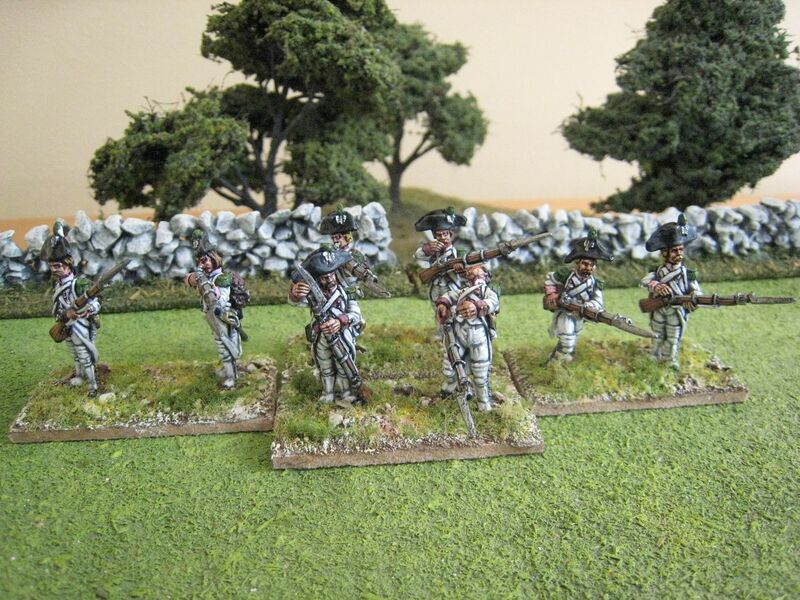 In addition to the Regiment Dillon, the Savannah scenario (in the second "British Grenadier!" scenario book) requires composite fusilier battalions of 16 and 18 figures respectively. This reflects the way in which elements from various regiments were formed together into ad hoc detachments. The notes to the Savannah scenario state that these detachments contained troops from the Cambresis, Champagne, Agenois, Gatinais and Auxerrois regiments. Therefore, when modelling these units you could paint up 1 or more stands from each of these regiments to recreate what happened in practice, or ignore that and field units of identically uniformed figures. I decided that for various reasons I wanted my collection to have several full regiments of French fusiliers, essentially to keep a large degree of flexibility in how I could field them. I intend to paint up 3-4 of the regiments mentioned above and then use various bases from those to form the composite untis required for Savannah (and other scenarios). I can then use the full regiments for "what if" games or larger scenarios. So here is a battalion from the Gatinais regiment. The flag is the more colourful second battalion flag. I understand that the regiment had been stationed in the Caribbean since 1775 and a detachment went to America in 1779 with d'Estaing. The chasseur company in particular distinguished itself at Savannah, with most of its officers becoming casualties. The remainder of the regiment arrived in 1781 with Saint-Simon. The regiment again distinguished itself in the attack on Redoubt 9 at Yorktown, which the regiment's grenadiers captured with men from the Royal Deux-Points regiment. Apparently, Washington expressed his admiration of and gratitude to the French units by presenting the two regiments with the cannon which they had captured from the redoubt. The flag is from GMB. I have seen references to the Gatinais flag being black and violet rather than the black and blue as shown here. I gather that Richardson in his Standards and Colors of the American Revolution states that the colours were black and marine blue, and presumably GMB followed this source. The figures are in the 1779 ordonnance uniforms, which is certainly wrong for Savannah and probably still wrong for Yorktown. However, Perry Miniatures only offer standing figures in the 1776 dress and I wanted more active poses for Savannah and Yorktown. 18 figures. Painted February-May 2011. Flag from GMB.